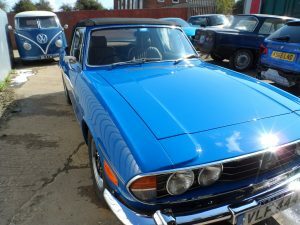 This Triumph Stag came to us for an accident repair after a bump on a country road. Why not let us deal with your insurance claim for you, removing the hassle and headaches it can cause. 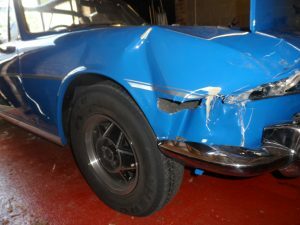 Once you have reported the accident and have a claim number we can take care of the rest, including the collection and delivery of your car if requried. All insurance companies have their own list of approved repairers. These are simply their first choice for the bulk of their work, not necessarily the best place for your classic. Most insurance approved repairers are geared up for a high throughput of modern cars. The technicians are heavily bonus based on throughput and speed. Generally such establishments will not have the experience or inclination to work on classics. This work takes time and would damage their bonus. As such your car could be rushed through resulting in a sub-standard job. 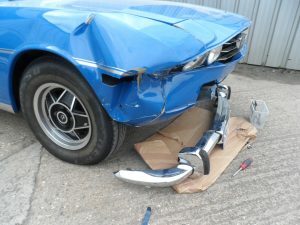 Sourcing parts for classics can be time consuming, even if you know where to start, it is very different from finding a new bumper for a Ford Fiesta. Proline have the suppliers to source rare parts, and a team that can fabricate panels that are no longer available. 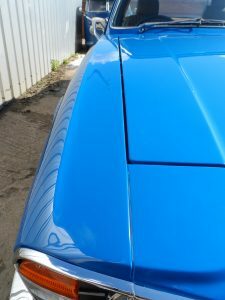 The colour matching of existing paintwork can be a tricky and time consuming process. 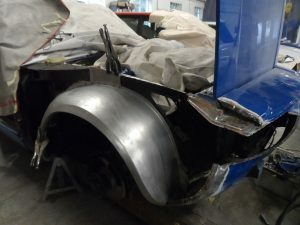 Work on classic cars can take longer than you would first think as there can sometimes be hidden problems that do not become apparent until the car is stripped.